Fully programmable controller can be ordered with different thermostat software to be set up for practically any heating and cooling application. The RS485 network port allows remote management and scheduling from a BMS that uses Modbus RTU or Modbus IP*. - High accuracy temperature sensor and PI algorithm provide a comfortable indoor environment. - 8 external inputs for auxiliary monitoring of external temperature sensors, 5 dry contacts, 0-5V, 0-10V, 10K sensor, 4-20 ma inputs, 3 analog 0-10V outputs. - Customization sequence of operations for multi speed fan coils, VAV, heat pumps, air conditioners, zone valves, heaters, light controller, etc. 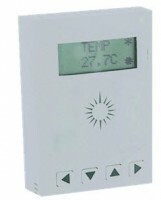 - Over 300 parameters make it one of the most flexible thermostats on the market. If we're missing some features let us know and we'll add them. -Modbus protocol for easy integration with automation systems.